New on display in the entrance to New College Library is the Works of King James I of England and VI of Scotland edited by James Montagu, Bishop of Winchester, and Dean of the Royal Chapel. With an engraved portrait of Prince Charles (later King Charles I), and later the Royal Coat of Arms this contains James’ paraphrase of the apocalyptic books of the Bible, as well as works on royalty and church and state. It was published in 1619, in James’s lifetime. The volume has a vellum binding covered in a stamped gilded decoration of scattered flowers around a central image of a wild boar. Part of the Dumfries Presbytery Library, the volume is inscribed Ex Libris Johannes Hutton. Dr John Hutton, a graduate of the University of Edinburgh, became the first Treasurer of the Royal College of Physicians of Edinburgh (1681–82), and Court Physician to King William III and Queen Mary (1688–1702). 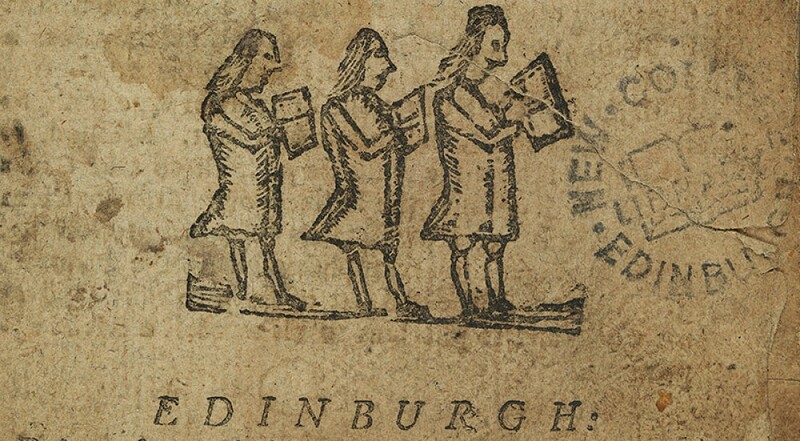 Later he was also MP for Dumfries Burghs (1710–12) and when he died in London, in November 1712, he gave as a bequest his library of 1,500 volumes to the Presbytery of Dumfries. Much of this is preserved as the Dumfries Presbytery Library, now kept in New College Library. This item was recently catalogued online as part of the Funk Cataloguing Projects. This entry was posted in Rare Books at New College Library and tagged Dumfries Presbytery Library, Funk, Latin, new college library, rare books, seventeenth-century, theology in history by cloverodgers. Bookmark the permalink.